Sesfontein Conservancy has confirmed that the provision of water at Hiri Hoas will provide farmers with a viable alternative to open water available in the Hoanib River west of Elephant Song. The facility has an electric pump but no generator. Thus a portable generator is required. 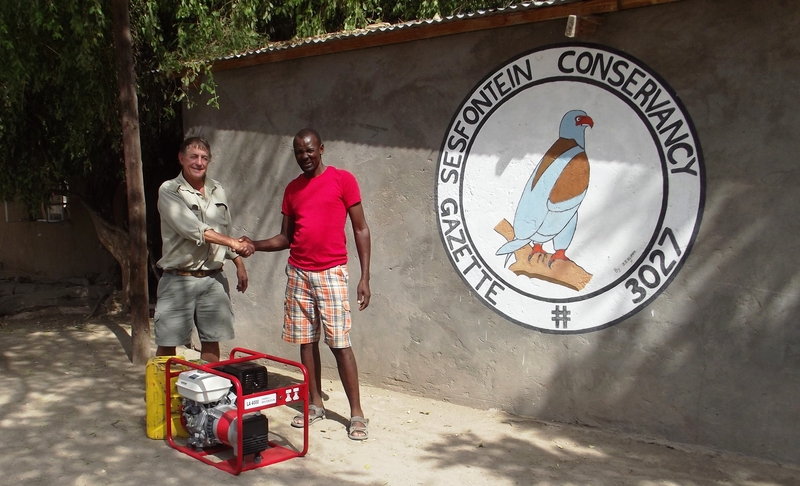 TOSCO therefore funded a generator at Sesfontein conservancy for an alternative water hole for the herders to be able to keep their livestock away from lions when leading them to drink. Sponsored in 2012, the generator has been delivered on the field on 2013. TOSCO helped to maintain the Huab lion-proof kraal (enclosure for livestock) sponsored by TOSCO in 2012 with a shade net to provide protection of livestock from predators like lions at Slangpos. This upgrade help local communities to benefit directly from tourism, reduce Cattle/Lion conflict and increase tolerance from the farmer.